Truth and Light: Doctrine and Covenants Lesson 35. "A Mission of Saving"
Doctrine and Covenants Lesson 35. "A Mission of Saving"
Dear to the heart of the Shepherd, dear are the lambs of his fold; Some from the pastures are straying, hungry and helpless and cold. See, the Good Shepherd is seeking, seeking the lambs that are lost; Bringing them in with rejoicing, saved at such infinite cost. Dear to the heart of the Shepherd, dear are the "ninety and nine"; dear are the sheep that have wandered out in the desert to pine. Hark! He is earnestly calling, tenderly pleading today, "Will you not seek for my lost ones off from my shelter astray?" Out in the desert they wander, hungry and helpless and cold. Off to the rescue we'll hasten, bringing them back to the fold. In 1856, five handcart companies were organized from Iowa heading toward the Great Salt Lake Valley. Of those five companies the majority were Saints that had emigrated from Great Britain and desired to join the fellowship of Saints gathering in the Zion of the Salt Lake Valley. Many had already submitted to great hardship and sacrifice to reach their destination. Three of these handcart companies arrived safely but the other two, led by James G Willie and Edward Martin, and made up of almost 1000 saints, were to have a very different experience. Due to communication issues, handcarts had not been prepared for the Martin and Willie handcart companies and so their departure was delayed. When the handcarts were finally made, many had been hastily put together with inferior wood that was unable to handle conditions on the prairies. Faced with a decision to hold or to push on the Saints decided to push on in the hope of reaching their Zion before winter arrived. In the modern day, there would have been an inquiry into who did what wrong and why and someone would of necessity be held accountable. Do you think blame can or should be apportioned here? Why or why not? Unfortunately for them the winter of 1856 came early and with a ferocity that caught them unawares and unprepared for the harsh, wet and cold conditions. "I was six or seven thousand miles from my native land, in a wild, rocky, mountain country, in a destitute condition, the ground covered with snow, the waters covered with ice, and I with three fatherless children with scarcely nothing to protect them from the merciless storms. I will not attempt to describe my feelings at finding myself thus left a widow with three children, under such excruciating circumstances. I cannot do it. But I believe the Recording Angel has inscribed in the archives above, and that my sufferings for the Gospel's sake will be sanctified unto me for my good." Although Elizabeth purposely did not attempt to describe her feelings, what kind of feelings could you imagine her feeling during this time? I imagine frustration, loneliness, desperation, blaming would be typical of feelings we could feel at this time. Other stories tell of a young girl called Nellie Purcell, barely 10 yrs old who fainting from hunger was forced to lay in the bare handcart. When they arrived in Salt Lake and took the stockings off her feet the skin came off with them because of frostbite. She had to have them both amputated. I will now give this people the subject and the text for the Elders who may speak to-day and during the Conference, it is this, on the 5th day of October, 1856, many of our brethren and sisters are on the Plains with hand-carts, and probably many are now seven hundred miles from this place, and they must be brought here, we must send assistance to them. The text will be--to get them here! I want the brethren who may speak to understand that their text is the people on the Plains, and the subject matter for this community is to send for them and bring them in before the winter sets in. That is my religion; that is the dictation of the Holy Ghost that I possess, it is to save the people. The Gospel has been already preached to those brethren and sisters now on the Plains; they have believed and obeyed it, and are willing to do anything for salvation; they are doing all they can do, and the Lord has done all that is required of Him to do, and has given us power to bring them in from the Plains, and teach them the further things of the kingdom of God, and prepare them to enter into the celestial kingdom of their Father. What is Brigham Young teaching us about pure religion here? What part of Brigham Young's text that day makes you feel the Saints were right to continue their journey when they did, despite the hardship that followed? Brigham Young's words also remind me of the temple where we go as far as we can physically and then hand ourselves over to the Lord to seek further knowledge. When you think about it the temple is as close as we can be to heaven here in this physical world.We cannot, of ourselves, get any closer. The Saints of the Martin and Willie handcart companies, likewise had pushed themselves to the very closest they could physically get to their Zion. Ask yourself, and if you don't know take a look at your ward list/directory or ask a bishopric member how many less actives you have in your ward. Also ask yourself how many people live in your local town/city. Is this story not a metaphor for the great rescue effort we are called to undertake for less actives and non members? "When the Martin company reached the ice clogged Sweetwater River in early November the specter of crossing it under those conditions nearly broke their hearts and spirits. Due to the unusually early winter season that year the normally undaunting stream was became a formidable obstacle. Reportedly three eighteen-year-old boys, who had come from Salt Lake as part of the relief party, literally carried nearly every handcart company member across the river. When several of those being assisted offered to thank them, one of the youths said, "We don't want any of that. You are welcome. We have come to help you" (Rescue, 27). Upon hearing of this bravery and selflessness, Brigham Young declared, "That act alone will ensure C. Allen Huntington, George W. Grant, and David P. Kimball an everlasting salvation in the Celestial Kingdom of God, worlds without end"
"Reddick Newton Allred was one of the rescue party sent out by Brigham Young to bring in the Willie and Martin Handcart Companies. When a terrible storm hit, Captain Grant, captain of the rescue party, decided to leave some of the wagons by the Sweetwater River as he pressed ahead to find the handcart companies. With the blizzards howling and the weather becoming life threatening, two of the men left behind at the Sweetwater decided that it was foolish to stay. They thought that either the handcart companies had wintered over somewhere or had perished. They decided to return to the Salt Lake Valley and tried to persuade everyone else to do the same. "Reddick Allred refused to budge. Brigham had sent them out and his priesthood leader had told him to wait there. The others took several wagons, all filled with needed supplies, and started back. Even more tragic, each wagon they met coming out from Salt Lake they turned back as well. They turned back 77 wagons, returning all the way to Little Mountain, where President Young learned what was happening and turned them around again. When the Willie Company was finally found, and had made that heartrending pull up and over Rocky Ridge, it was Reddick Allred and his wagons that waited for them." 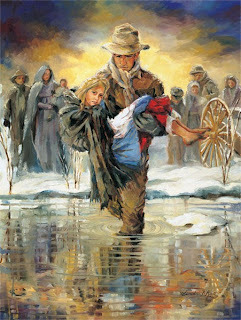 When it comes to our hometeaching and visiting teaching or our missionary work do we follow the example of C. Allen Huntington, George W. Grant, David P Kimball and Reddick Allred or are we more like the two unnamed men who tragically gave up on their rescue efforts and in turn by word or by example or both turned back the rescue efforts of others? In a world that is fast-paced it seems one of our major trials is whether we make time for the Lord and His work or whether we allow other activities in life take priority. When such work requires a little sacrifice and effort do we give up or do we press on? I believe the difference depends on what motivates us. We are generally motivated in the gospel by one of three things. Often early in our gospel lives we are motivated by Obedience. We want to please and do what is right. Obedience is the first law of heaven. Adam when he first offered sacrifice did not know why but he was obedient to the commandment to offer sacrifice. As we understand the gospel more we recognize why we do things more and we become more invested - not just obedient for obedience sake but also out of Duty. It is a recognition that it is not just about me but also others. I have a duty to others. The final and highest level of motivation in the gospel is Love. Why is this the highest motivator? Why does charity never fail? We are all sadly disobedient to God's commandments at some time, we have all failed to carry out our duty at some point. None of us are perfect. But when we finally obtain charity, the pure love of Christ - our motivation is pure. Because you are no longer doing it to be righteous or to please God, you are doing it because you love others. It is not a reaction to external circumstances but rather it is an innate part of you, you seek opportunities out. You cannot but help because that is you. "I am grateful that those days of pioneering are behind us. I am thankful that we do not have brethren and sisters stranded in the snow, freezing and dying, while trying to get to this, their Zion in the mountains. But there are people, not a few, whose circumstances are desperate and who cry out for help and relief. There are so many who are hungry and destitute across this world who need help. I am grateful to be able to say that we are assisting many who are not of our faith but whose needs are serious and whom we have the resources to help. But we need not go so far afield. We have some of our own who cry out in pain and suffering and loneliness and fear. Ours is a great and solemn duty to reach out and help them, to lift them, to feed them if they are hungry, to nurture their spirits if they thirst for truth and righteousness. There are so many young people who wander aimlessly and walk the tragic trail of drugs, gangs, immorality, and the whole brood of ills that accompany these things. There are widows who long for friendly voices and that spirit of anxious concern which speaks of love. There are those who were once warm in the faith, but whose faith has grown cold. Many of them wish to come back but do not know quite how to do it. They need friendly hands reaching out to them. With a little effort, many of them can be brought back to feast again at the table of the Lord. My brethren and sisters, I would hope, I would pray, that each of us, having participated in this great conference, would resolve to seek those who need help, who are in desperate and difficult circumstances, and lift them in the spirit of love into the embrace of the Church, where strong hands and loving hearts will warm them, comfort them, sustain them, and put them on the way of happy and productive lives."